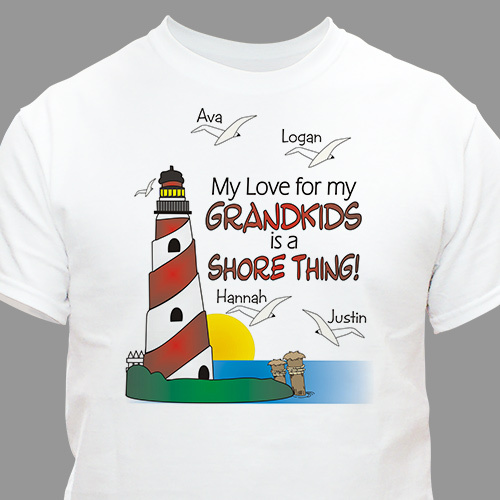 Grandma and Grandpa will both love their own Beach Personalized T-Shirts featuring their grandkids' names. The perfect, personalized shirt for lounging around the pool or spending quality time together on the boat. Your Personalized Grandpa Shirt is available on our premium white 100% cotton Personalized Shirt, machine washable in adult sizes S-3XL. Includes FREE Personalization. Personalize your Grandma T-shirt with any title and up to 30 children or grandchildren’s names. My rough and tough husband actually teared up when presented with this shirt. That says it all. Came out exactly how I thought it would. Great I love the 2 shirts I got.i will be getting more things.thank you so much. GiftsForYouNow has a collection of Custom Printed T-Shirts. Our Custom Printed T-shirts are perfect for Christmas, Mother's Day, Father's Day, Sweetest Day, Valentines Day & Birthdays. Create a custom printed T-shirt for someone in your family today. Mom, Dad, Sister, Brother, Grandma or Grandpa will love this wonderful custom printed t-shirt which you have personalized just for them.